Thank you all for attending our annual banquet in which we can honor our award winners who stayed true to the founding principles of our nation. Like the American Founders, you stand above the fray of petty self-interest and serve the cause of life, liberty, and happiness for all citizens. We titled last years’ report “The Iron Cage of Bureaucracy” because State agencies and bureaucracies have grown to the point of strangling the economy. We have reached the point where increasing taxes brings in less government revenue, and we are stuck in an iron cage of our own making. Government agencies create jobs, but in 2010 in the United States 21% of all people were employed by the government. That means that four workers support each government employee, or that 25% of private wages go to support government employees. And, this doesn’t begin to cover the cost of government contracts and procurements from the private sector or money spend on welfare payments to the unemployed or other government expenditures. Clearly, our citizens are being oppressed by our governments. In 2009 and 2010 we actually saw a decline in government jobs. Governments had to lay people off because they had less money. And, since they already have taxed to the limit of generating more revenue, we found out what happens—rationing. President Obama has asked for a moratorium on all discretionary U.S. spending, but the state of Minnesota really has no discretionary spending left, unless it carves out some of the existing programs to make way for new ones. Last year the Minnesota Legislature acted as if these conditions did not exist. It went ahead and spent more money to create more government jobs because the private sector wasn’t employing enough people. Well, how are you going to pay for these jobs, the answer was to borrow more from the future through bonding, or take fake wealth from the federal government with freedom-stifling strings attached. This year we are faced with mounting State debt and Federal debt as a result. The 2010 legislature passed legislation that created additional agencies like the Minnesota Enterpreneurial Resource Virtual Network, because existing agencies—the Office of Entrepreneurship and Small Business Development, and the Secretary of State—weren’t doing enough to create small businesses. The misguided thinking that when you have a problem it will be fixed by creating another agency has to end. Yet the bill passed the Senate 53-0 and the House 121-10. The Legislature has been good at creating agencies, but not good at fixing their problems or eliminating duplications in agencies. If you read through our 2010 Report, you will find that all kinds of chicanery took place last year. One bill allowed the construction industry to establish building codes that will net contractors more revenue by requiring more things you are forced to buy in new construction. Another bill papered over illegal bus procurements by the Met Council. Another created a “collaborative bureaucracy” that has defined eight government-dependent special-interest groups to advise the State Auditor on new legislation, elevating dependent people above responsible ones, and violating the principle of government neutrality. And, by the way, isn’t the purpose of an auditor is to audit, not to spend money? But that is another example of how distant our government has drifted from the purposes and principles of good government. We also witnessed cozy ties between public utilities and the state government in last year’s legislation. Public utilities are one type of corporation that the state can force taxation upon in exchange for regulation and monopoly status. We know that less than 20% of U.S. Corporations show a profit and pay taxes, but those in bed with the government can be forced to pay taxes for concessions that ultimately raise prices on citizens. Our state has not hesitated to milk our utilities as much as possible, and they can pass on the taxes to citizens as rate increases—meaning they ultimately don’t pay taxes anyway—it’s all smoke and mirrors. The citizens of Minnesota are oppressed by an aging, incompetent, and inflexible government of our own making. We put ourselves in this iron cage. As long citizens were incrementally taxed, but still able to pay their monthly bills, they remained silent. But as in all ponzi schemes and bubbles, the bubble of unwatched state bureaucracy has burst. Many former middle-class citizens are now unemployed and on welfare, others have become lower-middle class and are working two part-time jobs without employer health insurance. Many have lost their homes. Whatever you hear about profits on Wall Street, they are not affecting these people because most of those profits are made by reducing labor costs, not by new production of goods in the United States. I view the Tea Party as a Messenger, and a lot of people are reacting to it, trying to kill the messenger. A lot of established interests want to infiltrate and take over the Tea Party and make it play their tune. The Republican Party has to thank the Tea Party for a lot of new Republican faces, but these new Republicans are not your traditional Republicans that will push for subsidized oil, ethanol, wind farms, foreign wars, or big Republican government. They do not want Republican-original programs like “No Child Left Behind.” They want limited government, constitutional government, and responsible, fiscally balanced, and affordable government. Many Republicans are not happy with the Tea Party, because their own gravy train is in jeopardy. But, if the Republican Party fails to address Tea Party concerns, the Tea Party might try to create a new breed of Democrats for the next election. Perhaps they will create a modern version of the Jeffersonian Democrats. For the Tea Party has become the special interest lobby on behalf of middle-class citizen that has not had much of a voice in government for a long time. Our American governments need a major overhaul to return to their proper role and to function in an efficient manner. Just as our founders designed our government to function well, we need to redesign it around the same basic principles that operate in the real world, not some ideological rationalization of either the right or the left. We need a solid understanding of human nature and incentive, and we need proper checks and balances to prevent corruption, conflicts of interest, and the centralization of both political and economic power. We need to overhaul the system of taxation so that production is not taxed, forcing jobs overseas; and so that greed, mergers, and acquisitions are not subsidized at the expense of U.S. manufacturing jobs. If we eliminated taxes on labor and corporations, the cost of American-made products would go down and our economy would be more globally competitive. If we changed from income taxes to sales taxes, we would tax Chinese-made and American-made goods at the same rate, creating a much more level playing field and a freer market. For those of you who think eliminating trade barriers has created a free market for Americans, think again. It was a movement toward global free trade, but our income taxes on labor and corporate taxes force us to be less competitive globally. Another key point I want to make every time I speak is that we need to end the system that allows special interest legislation to prevail. The primary culprit is combining bills so that many low-priority, tax-wasting projects, and earmarks can be stacked together in garbage bills. Please work to restore the constitutional idea of single-issue legislation that has to have majority backing or it doesn’t pass. Montesquieu and Madison believed that gridlock was superior to allowing special interest legislation to pass, which is why they supported the idea of two houses to begin with. The so-called idea of “compromise” or “across-the-aisle-legislation” is nothing more than an end run around the constitution. This has to be brought to an end to restore a government of and for the people. The rise of the Tea Party in many ways reflects the message of limited and responsible government that LEA has been promoting for 39 years. Our highest LEA scorers seem to be those close to many Tea Party concerns. 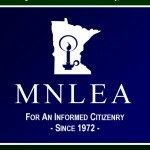 It is indeed with a sense of relief that in Minnesota some of the best new legislation for 2011 is now being introduced by our consistent LEA winners. I’ll not make any more remarks at this point, you can read my book, or better yet, work with us on our report on the 2011 legislature this year. You don’t need to be a board member to serve on the committee that analyzes bills and drafts the report. I’m sure you are waiting to hear from our keynote speaker. We are fortunate to have with us this evening a local Tea Party Patriot, Mr. Walter Hudson. Walter lives in Plymouth and works as a Security Guard. Like many Americans, he was not interested in government, but in earning a living, raising a family and pursuing life, liberty, and happiness. But enough is enough and Walter, like many others, stood up after the housing bubble, manufactured by the collusion of government and Wall Street, burst. Walter usually just talks about the nature and history of the Tea Party movement. But now that we are past an election and have several of our legislators in the room, I hope he will also be able to tell us what he thinks the Tea Party expects from our legislature and from the new legislators they supported. Let’s all give Walter are very warm welcome.